The 2018 International On Purpose Journey 9/11 STAND Remembrance began on August 23rd and lasted 39 days. We listed the names of our fallen heroes. Every day was a different list of those who made the ultimate sacrifice–firefighters, law enforcement, military from the Pentagon and WI killed in action since 9/11/01. All patches and coins from around the world that have been donated were posted to highlight those who have been a part of STANDING with us. It was a beautiful tribute that honored our fallen, along with letting our Gold Star Families know that their loved ones are not forgotten. Thank you to all who join us to remember our heroes by posting a photo of a drink, a coin, a comment…once or every day. Thank you to those who climb for the fallen, carry a name during a run/walk, and all those doing something to remember our service peeps. WE WILL NEVER FORGET. Posts are shared from our www.Facebook.com/OnPurposeJourney page. For all your continued support for our mission, we thank you as we journey together to make a positive difference in the lives of our heroes. A HUGE Thank You to all who made our 9/9/17 and 9/11/17 International STAND Events a success! For our 9/9/17 Event, thank you to our Honor Guard, Piper, Bugler, Chaplain, Gold Star Mom Kay Castner, and attendees for making the event a meaningful tribute to our fallen firefighters, law enforcement, and military heroes! Our volunteers packed 10 Morale Builder Packages to send to our deployed platoon–Thank you to everyone who contributed financially so we could fill and ship the boxes of love to our heroes! Thank you to all who participated in our 9/11/17 International STAND Event with coins, beverages, and names–you truly showed unity and the greatness we have in our cities around the world! There was an additional blessing during our event where we had families and friends tagging the families of these fallen heroes, so they could see their loved ones were not forgotten–the love was flowing and the remembrance was incredible! Thank you all for joining us to STAND! We will not forget! We will deliver 9/11 messages of awareness, unity, and gratitude to honor the heroes that selflessly rallied for our safety 16 years ago and still do today. Donations received from our amazing sponsors and donors will be used to fill and ship care packages overseas to our troops, as we have a firefighter/Marine/Seabees platoon currently deployed. We are grateful for the incredible support so we can send Morale Builder Care Packages to our deployed platoon, every month, until they return home. Location & Partner: Home2 Suites by Hilton Hotel at N91 W15851 Falls Parkway, Menomonee Falls, WI 53051–across from the WAC off of Hwy 45 and Pilgrim. Note: This event will also be the platform for our online 9/11/17 International STAND Team Event where we will honor our 700+ fallen heroes with support from around the world! Join us to Stand With Those Who Serve and Stand For The Fallen. These events are able to take place due to numerous volunteers and phenomenal donors as well as our friends in the media!! On 9-11-16, we remembered 600+ service members (firefighters, law enforcement, military) who made the ultimate sacrifice, at our STANDING FOR THE FALLEN 9-11-16 Memorial Tribute, hosted by the Milwaukee Fire Department and On Purpose Journey Inc.
*The fire departments/law enforcement/military departments and agencies that joined us in the Protective Services 9/11 Mobile Story Parade, Frog-X Parachute Jump, and Memorial Tribute. *Everyone who attended and joined us in standing with those who serve and standing for the fallen. 9/11 Tribute Events hosted by the Milwaukee Fire Department and On Purpose Journey Inc. Educate our Youth. Promote Unity in our Community. 4:00pm – 4:30pm – Frog-X Special Forces Parachute Team landing near the event to kick-off Standing for the Fallen at the War Memorial Center with MPS’ MHSA Vocal Jazz Ensemble! Honoring the 343 fallen firefighters, 72 law enforcement, and over 200 military service members killed in the attack on the Pentagon and military service personnel born in Wisconsin who made the ultimate sacrifice since 9/11/01. 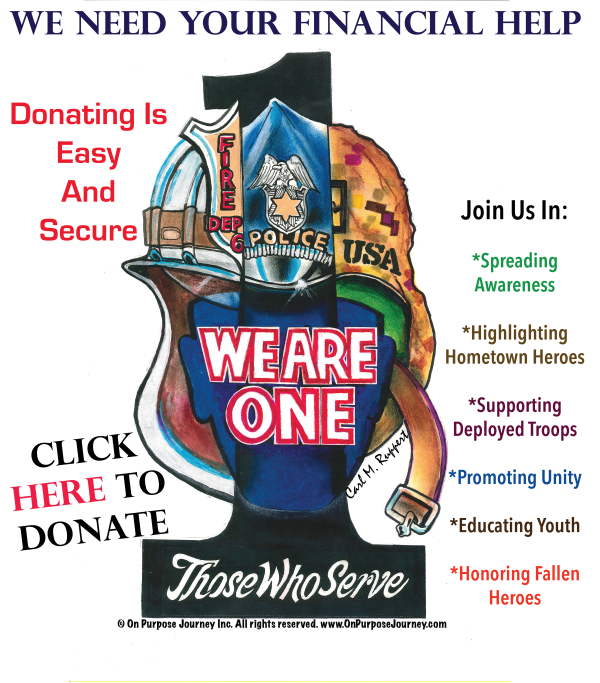 We Are One Art Displays honoring ALL those who serve. Stamped dog tags on Honor and Liberty Trees. Lights. Flowers. The ringing of the bell. Each name read aloud. Steel beam from New York. Honor Guard presentation of colors. VALOR Level ($2500-$4999): Johnson Controls, Inc.